Providing first-class service to every single Gym member, be it a Walk In Member, Monthly member, Platinum Member or Life Time member is vital in today's highly competitive environment. First impressions last. And therefore the entry point treatment plays a major role in creating a professional image for a Gym/ Health CLub. A well-coordinated reception area and the Gym Entry is the ideal way to manage your members efficiently and give them the attention they deserve - and the best news is that you don't have to invest in highly skilled man power to achieve the same. The Gym Management System is designed to facilitate the Gym / Health Club in doing away with the manual process of maintaining Registers for Member Data, Invoices, Payment Details, Validity Checks, Counter Checks etc. Different Login for each user. Feature to add Date Validity, Counter, Happy Hours etc and store the same in the reader. All systems developed as per INDIAN environment. Identify and Online view of the members, provide authorized access to various facilities of the gym/Health club and allow only authorized members to enter the Gym and access the facilities as also purchase food and beverages at the gym/club. The reader can be used for various applications. For gym/club these could include authenticating the member. Validating the user’s usage through dates and number of usage or both. Invoice Generation and Membership Billing and E-cash for selling other items at the various gym/club. The software has been designed to meet the future requirements of any gym/club, allowing the gym/club to charge different rates for Daily, Monthly, Annual members, and have further divisions such as Peak or Happy Hours users. The solution will allow the members to scan their finger templates where the information like Membership number and its validity period, Facility access points and their validity etc can be stored. o Provide access to active members, while inform the gym/club if any memberships have expired. It will also beep when guests come, so the gym/club can issue them temporary cards. o Update records each time the member uses facilities such as the gym/club, squash Courts, Billiards etc., and reduce the points on the card. o Reduce or increase the monetary amount on the wallet whenever a member/dependent/guest makes a purchase at the gym/club; or pays additional money at the cashier. o The system will also allow only authorized members to enter the gym/club and access the parking lot. 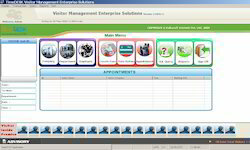 We are well acclaimed as a prominent firm engaged in offering highly demanded Visitor Management System. Get impressed with the easy and high speed system which eventually complements the security system of any premises. The offered system captures photographs and additional information of the visitors which streamlines the process of confirming or cancelling the appointments at companies. We have complete allegiance in offering highly advanced School Management System. A large number of schools and education institutions are attaining the benefits of our next generation software that operates of fingerprint and card system for sending SMS to parents and guardians. The innovative approach of this system eases the task of management of school buses and due to the proficiency of our team the system offers unmatched performance without eating up the speed of your computer system. Tracking of Buses and Children for Schools Through the use of Fingerprint or RF ID Card Based Systems and GPS Enabled School Buses. “TIMEDESK”, as the name suggests, has all the features of Attendance and if clubbed with the payroll package is exhaustive software, which can be used for the HR, Admin and Accounts department to generate various types of reports. The software can be used for single companies, multiple companies and companies with different class of employees like permanent, daily basis, casual etc. The software has all the user-friendly features to run independently without any EDP person. Many organizations establishments like corporates, hostels, schools, hospitals provide Canteen as an additional subsidized facility to their employees as a welfare measure. The usage of the canteen by the employees depends on many factors like centralized food distribution center with swift and simplicity in operations. TimeDESK provides a user friendly system that facilitates quick and efficient operations to cover larger section of employees within a specified time. CMS is paperless and has almost cashless transactions. This system is also compatible in an environment where multiple caterers operate in a closed environment or at multiple locations. Various establishments like corporates, hostels, schools, hospitals often support their own canteen. Till date the entire canteen process from controlling long queues to food selection to payment is manual and subject to inaccuracies. It also involves lots of cash transactions, handmade coupon generations and food planning. TimeDESK Canteen Management is an automated process starting from placing an order to delivery including the payment. It allows item tracking, secure and speedy transactions; prevents wastage of food and error in accounting. 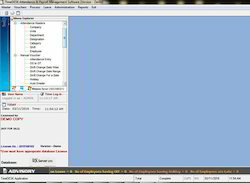 It helps management to handle the users smoothly thus reducing the waiting time for the users. TimeDESK is a canteen management system, aimed at automating the transactions associated with canteen usage and thus convert the tedious, prone to inconsistency, time consuming process to a simple and fast solution. Being cost effective yet highly efficient, and easy to install and operate and is a fully integrated client server application. 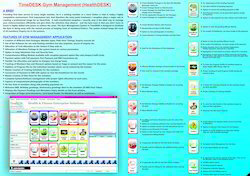 “TimeDESK” Canteen Management Software is very simple, flexible and user-friendly Canteen software especially for INDIA.